Dermody Cleaners Free Home and Office Delivery Service was created and designed as a convenience for people who need to look their best but are often hard-pressed for time. 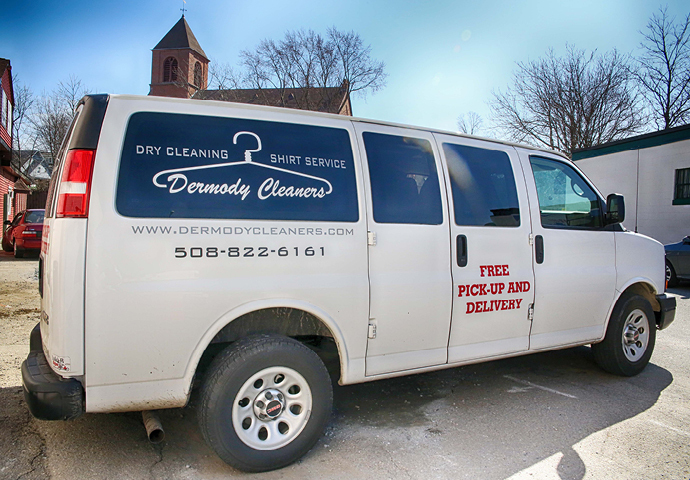 You can arrange for Dermody Cleaners to pick up and drop off your dry cleaning at your home or office building. You’ll never have to wait in line for cleaning again. We service on either a Monday/Thursday or Tuesday/Friday schedule. What’s dropped off on Monday will be cleaned and returned on Thursday, and vice versa. You will receive a laundry bag featuring our logo, just fill it up, and leave it for our driver to pick up on your scheduled delivery day. We will return it on the next scheduled day, ready to wear! Then we just charge your credit card for what we cleaned, and email you a statement. We can even bring the service right to your office! That’s perfectly fine! Most of our customers aren’t home when we pickup or deliver. They just agree on a place with our driver to leave/drop the bags. Porches, front doors, mud rooms, sun rooms, and garages are all perfect! We keep a credit card on file and charge it on the same day each month for the prior weeks’ deliveries. We will email you a statement detailing the charge. You are charged the same rates you would if you came into our stores personally, with no additional fees. There is no contract and no minimum! So if you need to put your account on hold during slower months or for vacation, it’s not a problem! If there’s no bag out, we simply don’t pick up that week! Or just call us to tell us not to come. You can cancel without penalty at any time! How do holidays, snow, and weather affect the service? If we change the delivery schedule for any reason, we will call and/or email you as soon as possible. If the roads aren’t safe for our drivers, we will not run our service.